Stand and Deliver: Summer sling sale! I am excited to now carry handprinted cotton batik and two-tone silk dupioni slings in addition to my normal selection of linen slings. Check out the beautiful new fabrics at Second Womb Slings. Take advantage of the summer sling sale and my expanded inventory. 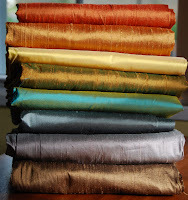 Batik slings are on sale for $45 (normally $50) and silks for $50 (normally $60) through end of August. And take advantage of free shipping if you order two or more slings! So beautiful, and your slings are so well crafted. I use the one I bought from you recently nearly everyday. Wish I could afford another. Rixa, do you make slings for children? My almost-2yo has been needing more "UP" lately and we're back to the hip carry in a Hotsling, after not using it for probably a year. The only issue is now she wants to wear it but it's too big for her and she can't get it on. I'd love to have one in her size that she could carry her "bebe" in. Yes, I make child-size play slings for $15. Email me for fabric availability.